MakeSpace is located at Level 2, Station Arcade, 52 Hindley Street Adelaide. 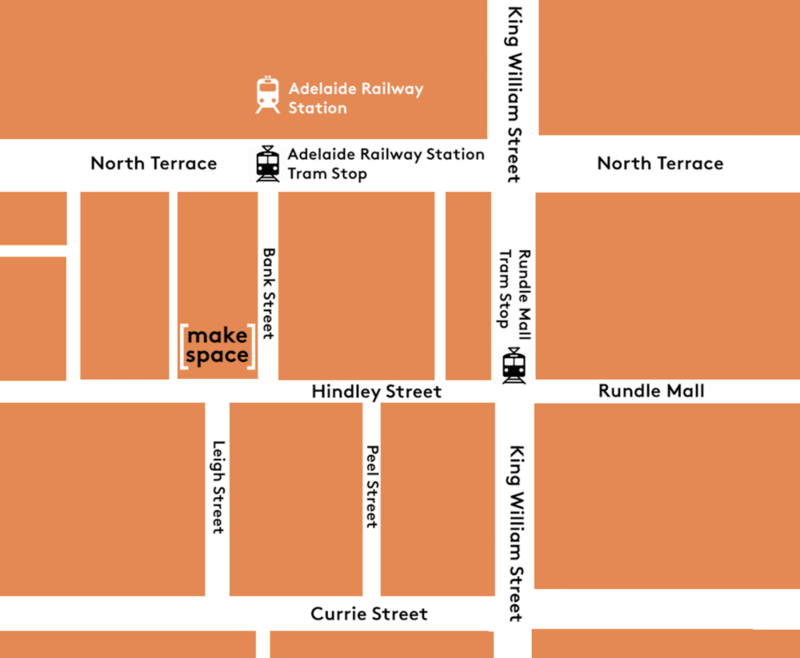 Access is through Station Arcade, which can be reached directly from Hindley St, Bank St, North Tce and Adelaide Railway Station. MakeSpace is a five-minute walk from the turnstiles at Adelaide Railway Station. MakeSpace can be accessed through Station Arcade via stairs and/or escalators. For access without using stairs or escalators, take the lift at the end of the Railway Station underpass to North Tce (Lower Ground to Ground), and then go along Bank St to Hindley St; or enter Roma Mitchell House, taking the elevator near the stationary shop from Level 1 to Level 2 (Hindley St equivalent Ground Floor), and take the elevator near My Goodness from Ground Floor to Level 2 – this is the top floor on the elevator buttons. There is limited on-street parking. The nearest commercial car park is Care Park on Blyth St; this car park also has disabled bays. To access MakeSpace from the car park, take the lift to Level 2 (equivalent to Hindley St Ground Floor), and then the lift near the Hindley St entrance to Level Two. For accessible drop-off use Bank St where there is no lip between the road and the footpath. MakeSpace endeavours to be accessible for as many people as possible. If you, or someone you know, will be attending one of our events and has access requirements please let our staff know how best to accommodate you and your needs. ActNow are able to modify our existing work, or create new work, with and for people with a wide-range of disabilities, their families, and their careers. If you would like to talk to us about these possibilities, please get in touch. Our work is participatory, interactive, and driven by the audience – we want everyone to take part, but you can contribute as much or as little as you wish. Any information incorrect or missing? Please email us and we will adjust.